To prevent the exploitation of vulnerable patients and adopt fair practice in conducting medical research, many regulations (Nuremberg Code, Declaration of Helsinki) were brought in. The Nuremberg Code was the first international document which came after the infamous Nuremberg trial and it contains 10 points emphasizing on sound scientific research and importance of consent. The Declaration of Helsinki was first published by the World Medical Association in 1964 and updated many times, this document is considered as a document of ethical principles for medical research involving human subjects, including research on identifiable human material and data. All regulations emphasized adherence to four-cardinal principles of medical research (autonomy, nonmaleficence, beneficence, and justice). In India, the medical research is carried out by the guideline prepared by the Indian Council of Medical Research (ICMR). The ICMR published the “Policy Statement on Ethical Considerations Involved in Research on Human Subjects” in 1980, for the first time, and has revised it periodically, the latest revision being carried out in 2017. Nuclear medicine is a branch of medicine that uses radioactive isotopes (radionuclides) in the diagnosis and treatment of disease. In nuclear medicine procedures, radionuclides are combined with other chemical compounds or pharmaceuticals to form radiopharmaceuticals. In recent years, the scope of nuclear medicine has expanded tremendously and is now routinely included in the diagnosis and management of many malignant and nonmalignant conditions. The ever-increasing contribution of nuclear medicine to the field of medical science is made possible by the path-breaking research and innovation carried out by the stalwarts of nuclear medicine over the years. However, the radioactive nature of materials used in nuclear medicine practice is an important barrier for the development of new radiopharmaceuticals and delineates nuclear medicine research from other branches of medical science. In India, radiopharmaceuticals use is regulated under the provision of the Drugs and Cosmetics Act, 1940 and Rules 1945. The ICMR has laid down separate guidelines for research of radiopharmaceuticals either as diagnostic or therapeutic agents. If the radiopharmaceutical is to be used for therapeutic purpose, then the ethical guideline meant for the new drug testing should be followed. If radiopharmaceutical is to be used as a diagnostic agent, then the rules are different. The ICMR guideline articulates that the permissible radiation limits must comply with regulatory authority guidelines while evaluating any radioactive materials. The guideline also enunciates that when any trial involving radioactive substances recruits healthy participants, these individuals should preferably have completed their family and should receive radiation in a dose as low as permitted. The ICMR guideline states that women of childbearing age, children, and radiation workers or any individual who has received more than the permissible amount of radiation in the past 12 months should be excluded from trials involving radioactive materials or X-rays. It also emphasizes that the investigators carrying out the research work involving radioactive materials should be competent and trained to handle the radioactive materials. The research protocol for radiopharmaceutical research must clearly and unequivocally mention the potential exposure to which study participants are most likely to be exposed. The site where research is supposed to carry out the research must possess a license from the competent authority to store handle and dispense radioactive materials. The guideline outlines that ethics committee if it feels, may solicit expert opinion to review the protocol involving radioactive substances. The dose constraint for radiation exposure is one of the main hurdles in carrying out research in nuclear medicine. According to the Atomic Energy Regulatory Board (AERB) guideline, the permissible amount of radiation exposure to public is 1 mSv per year. Therefore, any individual who has received 1 mSv of radiation exposure in the past 12 months should be excluded from the research study involving radioactive substances. However, in the current medicine practice, a patient has high likelihood of getting medical radiation exposure during procedures such as X-ray or a computed tomography (CT) scan. An X-ray examination of thoracic or lumbar spine or CT scan exceed this permissible dose of 1 mSv and according to recent guidelines such patients should not be included in any research involving radiation. Hence, a wider deliberation is required to relook in to this permissible limit so that it should not become the hindrance for scientific research, but at the same time, it is to be kept in mind that the study participants are not unduly exposed to harmful dose of radiation. The World Health Organization (WHO) has categorized the research projects involving radiopharmaceuticals into three categories, depending on the amount of radiation received by the study participants [Table 1]. The permissible limit of radiation exposure is 0.1 mSv, 1 mSv, and 10 mSv for category I, II, and III, respectively. However, there is no category for radiation dose exceeding 10 mSv, probably because the document is very old and was drafted in the year 1972 when the first commercially viable CT scanner was invented. Newer diagnostic studies such as CT angiography and positron emission tomography-CT give much higher radiation than 10 mSv. 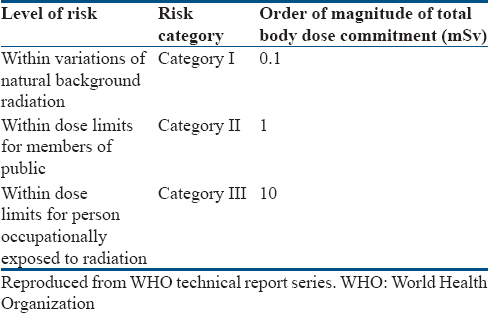 The IRCP in its report has slightly modified the WHO risk categorization [Table 2]. It has categorized radiation exposure in terms of risk and corresponding benefits. As these categorizations were carried out long back, so there is a need to relook into it. The health regulatory authorities of India can consider creation of such risk-benefit categorization specific to our population, based on available evidence and feedback from experts in the field. Further, women of childbearing age and children should be excluded from the research as per the ICMR guidelines. However, following this rule, nuclear medicine research cannot be conducted in the problems specific to women of childbearing age and children. International Atomic Energy Agency (IAEA) in the guidelines on biomedical research involving radiation exposure stated that the possibility of early pregnancy should be considered while women of childbearing potential are the study participants. Furthermore, pregnant women and mothers who are breastfeeding must not be involved in any project except where problems specific to their condition are under investigation and alternative techniques which do not involve ionizing radiation have been considered and rejected. Regarding children, the IAEA suggests that persons under 18 years of age should not be involved except when problems specific to their age groups are under investigation. Emphasis should be given that relatives of nuclear medicine research participant who is engaged in patient care, support and comfort should not receive more than permissible dose limit. Important point raised by IAEA is with regard to the risks to an individual who is involved in multiple research investigations involving radiation. This condition may arise unknowingly in any research program. These types of patients will get more cumulative harm than that estimated for an individual involved in a single research project. Therefore, necessary checks (including creation of a networked study participant database) should be in place to prevent individuals repeatedly taking part in research projects involving radiation. Another crucial aspect of diagnostic and therapeutic radionuclide research is to consider radiopharmaceutical quality control before each administration into human participants. Always pH, radionuclide purity, radiochemical purity, chemical purity, and sterility should be checked before human administration of radiopharmaceutical under investigation. Moreover, proper disposal of radioactive waste by laboratories conducting radiopharmaceutical research should be done as per the AERB guidelines. The research in nuclear medicine is important to explore the immense potential it offers. Any research involving radiation should be justifiable and must be planned in such a way that it should confer maximum benefits without causing substantial risks to the participants or the population at large. Moreover, in medical research, the benefit should not be confused in narrow sense and should always consider welfare of future patients and society. Therefore, there is a pressing need to devise a clear guideline based upon current perspectives. Markose A, Krishnan R, Ramesh M. Medical ethics. J Pharm Bioallied Sci 2016;8:S1-4. Brazier M. Exploitation and enrichment: The paradox of medical experimentation. J Med Ethics 2008;34:180-3. Shavers VL, Lynch CF, Burmeister LF. Knowledge of the Tuskegee study and its impact on the willingness to participate in medical research studies. J Natl Med Assoc 2000;92:563-72. Ghooi RB. The Nuremberg code-A critique. Perspect Clin Res 2011;2:72-6. Williams JR. The declaration of Helsinki and public health. Bull World Health Organ 2008;86:650-2. Gillon R. Medical ethics: Four principles plus attention to scope. BMJ 1994;309:184-8. Available from: https://www.icmr.nic.in/sites/default/files/guidelines/ICMR_Ethical_Guidelines_2017.pdf. [Last accessed on 2018 Oct 01]. Meher BR, Agrawal K, Padhy BM. The global perspective of pharmacovigilance in nuclear medicine practice. Indian J Nucl Med 2018;33:269-72. Available from: http://www.cdsco.nic.in/writereaddata/Notice%20Radio-harmaceutical.pdf. [Last accessed on 2018 Nov 22]. Available from: https://www.aerb.gov.in/index.php/english/radiation-protection-principle. [Last accessed on 2018 Dec 15]. 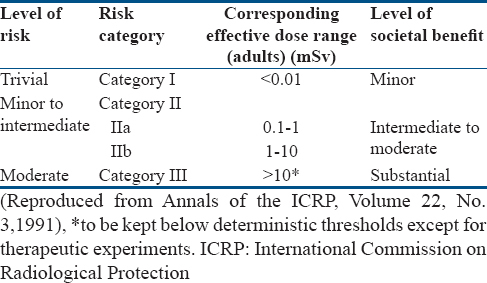 Mettler FA Jr., Huda W, Yoshizumi TT, Mahesh M. Effective doses in radiology and diagnostic nuclear medicine: A catalog. Radiology 2008;248:254-63. Available from: http://www.apps.who.int/iris/bitstream/handle/10665/41256/WHO_TRS_611.pdf?sequence=1& isAllowed=y. [Last accessed on 2018 Dec 28]. Radiological protection in biomedical research. A report of committee 3 adopted by the international commission on radiological protection. Ann ICRP 1991;22:1-28, v-xxiv. Available from: https://www.iaea.org/resources/rpop/health-professionals/nuclear-medicine/biomedical-research. [Last accessed on 2018 Dec 21].